One application of Un-Duz-It Unleashed does it all! 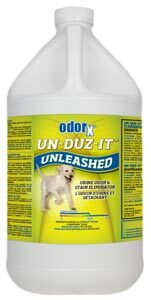 This unique breakthrough solution combines oxidizers with enzymes and odor encapsulants to remove even the toughest pet urine odors and stains. Effective on virtually any surface, including hard porous surfaces. Tabac-Attack works at the molecular level to neutralize and permanently deodorize materials affected by tobacco and marijuana smoke odors. 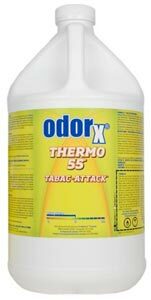 Tabac-Attack from OdorX is designed to permanently remove tobacco-related smoke odors. 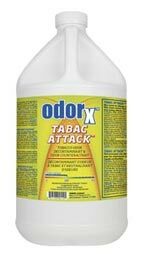 Tabac-Attack deodorizes materials and surfaces by reversing the ways by which materials become malodorous. This product is intended to be used with the Electro-Gen Thermal Fogger.